Brining a chicken and other meats has many advantages, fantastic flavor and juicy results being the most important. See below for the scientific stuff. Essentially, because some of the brine is absorbed into the meat, the flavors of the brine go with it and create a tender meal with flavor in every bite. Chicken with the bone in, including a whole chicken or pieces can be started up to twenty-four hours ahead. Boneless cuts and smaller cuts of pork, like chops, are best brined for eight hours or less. I like to buy Mary’s Chicken with the head and feet attached. I cut them off (you can have the butcher do this) as well as remove the spine creating a “spatchcock” chicken like the one in the picture. I roast these parts with the rest of the bird and when they are cooked and cooled, I freeze them with my collection of bones for stock. They add a caramel flavor and color to the stock. Delicious! All that needs to be done for dinner is putting the chicken in the oven on a bed of vegetables and perhaps cooking a starch of some sort. It’s that simple! The day before you plan to cook, combine all the brine ingredients with two tablespoons of the spice mixture reserving the rest for the next day. In a small pot over medium heat and with 1 cup of water, stir until the salt and sugar have dissolved. Add this mixture to the remaining brine in a large glass or stainless bowl or pot and cool completely. Put the chicken in the pot and top with a plate, if necessary, to keep the chicken submerged. Refrigerate, covered, for at least 6 hours or overnight. Heat the oven to 450ºF and remove the chicken from the refrigerator. Drain the brine. Peel onions if using, keeping as much of the root end intact as possible. Cut into 1-inch wedges, cutting through the root end so the layers stay connected. Cut other root vegetables into medium chunks and place in a rimmed roasting pan or sheet pan. Pat the bird dry with paper towels and place it skin up, on the vegetables. Lightly rub with olive oil and sprinkle with the reserved spice mix mixed with one-half teaspoon of salt. Roast, stirring the vegetables occasionally until the chicken reaches 165˚F at the deepest part of the chicken’s thigh, about 40 minutes. 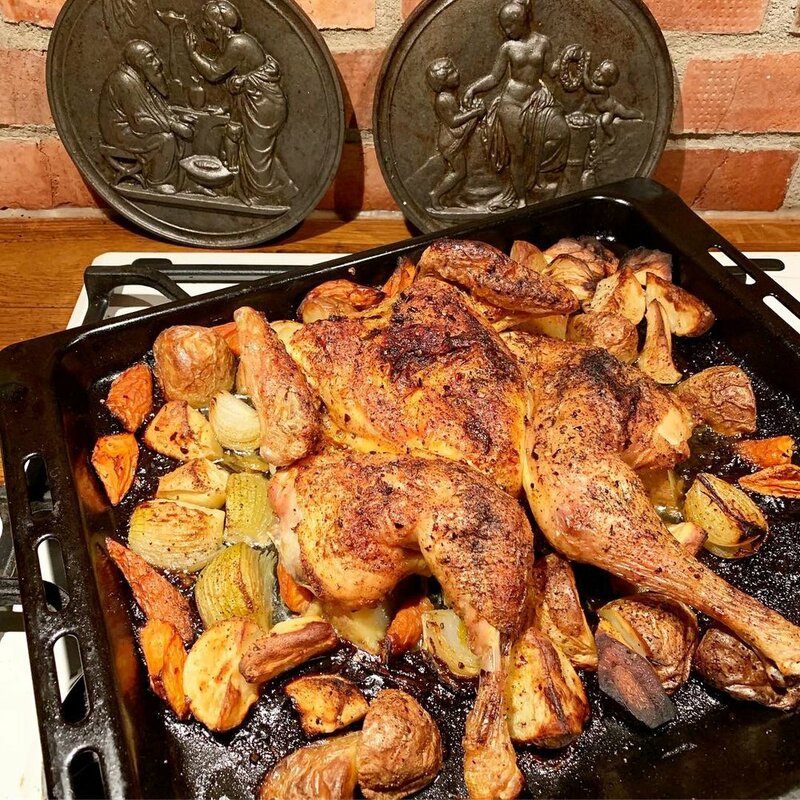 Remove the bird and vegetables to a cutting board or platter. Deglaze the pan while scraping the bits and simmer until reduced by one third. Drizzle the sauce over the bird. Meat absorbs some of the liquid: When a piece of meat is soaked in a brine solution, that solution is slowly drawn into the meat, and even though some of it is inevitably lost during cooking, it still makes a big difference. Since the meat starts out with more liquid within, it ends up juicier and more moist when cooked. Muscle fibers are dissolved: Highly concentrated salt solutions will cause proteins to precipitate (essentially forcing them to aggregate with each other and clump together). On the other hand, a low-concentration salt solution has the opposite effect and actually can increase protein solubility and allow more proteins to dissolve. So brine actually helps dissolve some of the muscle fibers, which helps to reduce the toughness of meat. Muscle fibers and meat proteins denature: A salt solution can denature proteins, essentially unfolding and unravelling them. As they unfold, water works its way in between these proteins so there is more water in between the meat proteins as the meat cooks. This results in a more tender cooked meat.